There was something exciting going on halfway across the room so the block area was left to a single builder who got to work. After several minutes, another builder joined him, watching for a bit without speaking, then getting to work on his own project in his own space, two islands of concentration in that checker board sea. In this short week before Thanksgiving, we typically run with a skeleton crew, what with all the traveling, either taking families away or bringing loved ones to our homes to stay with us. It's an easy week to stand back and just watch. We've made our lists of things for which we're thankful, but this is it for me, right along with my own family: our human drive to engage in projects and our equally human instinct to make space for others to join us. As the boys built, others came along; at first only asking questions, which is what the third arrival did, not becoming a builder, but rather a man of words, drawing out the words of a once isolated creator, compelling him to explain himself and his work, which he did eagerly to an equally eager audience. This is how we all learned he was building a "parking garage." The next two on the scene came together, watching for a moment, taking inspiration, already planning a duet, finding their own space, chattering, and managing the volume of their conversation so as to allow it to take place alongside the other one nearby, but not connected. They struggled, however, because the place they chose to build was right in front of the shelves upon which the rest of the blocks were stored. Others, in their quest for materials were inadvertently destroying their efforts. There were a few shouts of, "Hey!" and other cross words. I left my watcher's post to say, "They're not knocking your building down on purpose. 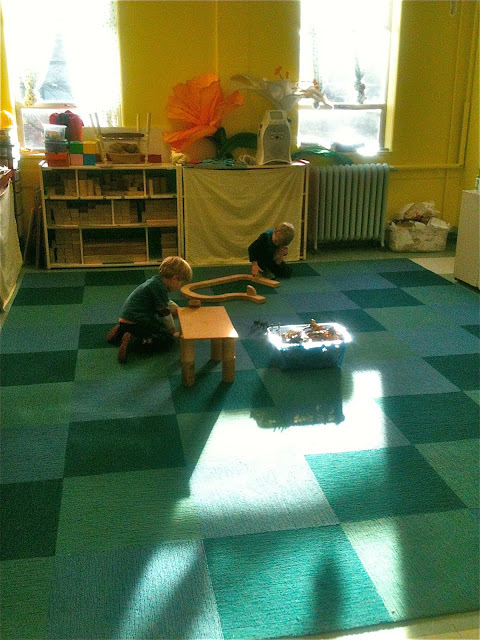 This is a tough place to build because you're right in front of all the blocks." I didn't tell them what to do, just stated the facts as I saw them. I used to do this kind of thing in a more stilted manner, saying something like, "I see that you're building in front of the blocks. Other people need to get the blocks and are accidentally knocking over your building." I really doesn't matter, I don't think, but I've worked hard to make what my 17-year-old daughter used to call "teacher talk" my own, to express the technique of speaking informatively in natural language. By the time I'd returned to my corner, they had, in the space created by my informative statement, decided to move, transferring their efforts to other spots on the rug, revealing to me that they had not been building together, but rather side-by-side. Now we had four separate efforts in progress. The words that passed between them were largely functional, except for those coming from our original builder, who was by now narrating his every move to his friend who chose the role of interviewer. Now others were joining us, collecting blocks, then dropping to their knees. Two more solitary projects began to emerge, fully encircling the original. One of the original builders informed us at some point that he was building a road, one that was beginning to move into any unclaimed territory. 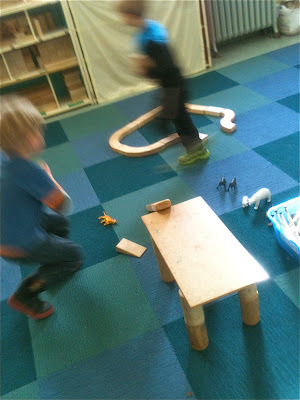 I'd created this invitation to play merely by "opening" the shelf with the wooden blocks and placing a box of "wild" animals on the floor, but the kids know that the "every day" cars are always available. 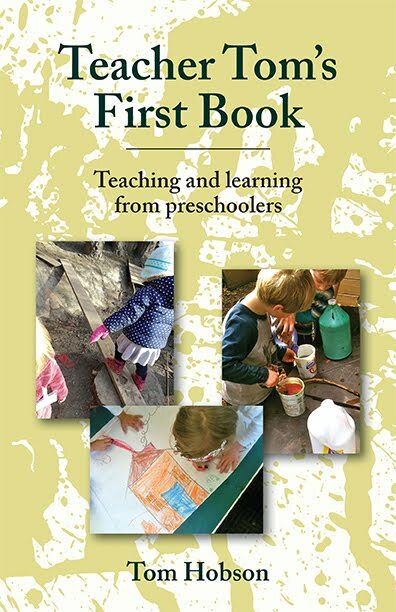 The children at the center turned increasingly toward one another as their constructions took up more and more of the the empty space. The ones on the edges could still turn their backs on the others, but this luxury wouldn't last. Growth leads to negotiation, compromise, and agreement, a chain of reason that makes civilization possible. Now there was precious little open space. A few children moved on to other things, while others moved in. At one point a boy arrived who had not been part of the building. He was a little wound up. He wanted to play in the space, but ignored the blocks at his feet, kicking a section of them over in his effort to engage others in his silliness. Usually when this happens, the response is loud and immediate, "Hey! You knocked over our building!" but in this case, after all this time of quiet, steady growth, the builders seemed at first shocked. Our corner of the room fell tensely silent as if everyone was waiting for something to happen. The boy with the rowdy energy shuffled his feet again, awkwardly, not sure what was happening, destroying more of what the others had created. I said, "Those guys worked really hard building that. You're knocking it down." He looked at his feet and tip-toed off. Within minutes what he had broken was restored. As the original builders began to move on, they left behind a cobbled testament to the short-lived civilization they had built alone and together. The children who played here now were inspired to engage in dramatic play, taking the constructive process into their imaginations, creating new things from the old, without disrupting what they had found, but arranging it for their new ideas: ideas like a parking garage that was now a "fairy animal castle," and a perfectly symmetrical "drive through zoo." It was the story of civilization told in an hour.